When the dwarves brought axes and fire to your clanhold, they intended to wipe out every troll. But they didn't finish the job! You are the only trolls left, and it's time for revenge. Unleash your monstrous nature as you play a troll in a bumbling, hungry, rage-filled quest for vengeance. 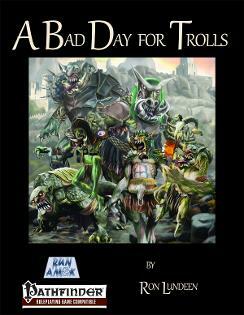 “A Bad Day for Trolls” is a unique monstrous adventure for the Pathfinder Roleplaying Game. The adventure includes numerous player handouts, including six ready-to-play troll “heroes,” from an icy troll cleric to a hungry troll ranger, and maps of all encounter areas ready for printing. “A Bad Day for Trolls” is written by Ron Lundeen, with art and maps by Marco Morte. Get it here from DriveThruRPG. For GMs in need of civilization! When you need a fully-detailed settlement right now, "The Emergency Settlement Collection" comes to your rescue. Ranging from tiny villages to massive metropolises, each of these seven ready-to-play settlements comes with a straightforward overview, history, notable locations, interesting characters, settlement statistics, new rules for PCs in or from the settlement, and secrets for the PCs to explore. Each settlement can serve as a jumping-off point for adventure, or a home base for an entire campaign. Full color maps of each settlement (tagged for GMs and untagged for PCs) are also included. 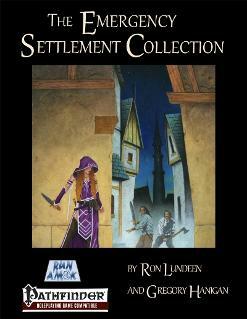 "The Emergency Settlement Collection" contains a city of art and song beset by dangerous foliage, an industrial metropolis bound to nefarious patrons, a gnome boom town amid a firearms revolution, a reclusive village of nature-warping lizardfolk, a mercantile river town with magical secrets, a plane-hopping city of vicious cannibals, and a sleepy frontier village near a pit of danger and adventure. “The Emergency Settlement Collection” is written by Ron Lundeen and Gregory Hanigan, with art by Stacy Drum, Sydney Lehmann-Secor, Marco Morte, Jeff Strand, Blake Wilkie, and Maciej Zagorski (The Forge Studios), with cartography by Tommi Salama, Marco Morte, and Hugo Solis. Get it here from Paizo or here from DriveThruRPG. For GMs in need of more beasts! The "Run Amok Bestiary" contains over 30 new monsters for your Pathfinder Roleplaying Game. 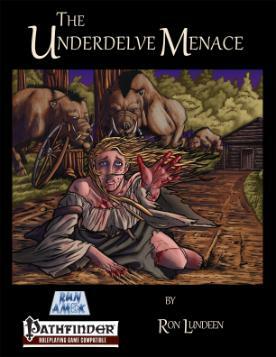 Drawn from real-world folklore, legends, and Run Amok Games products, this collection covers a wide range of creature types, terrains, and challenges. From tiny pumice warriors to the crag-dwelling mountain wyrm, from city streets to the cold and windswept plane of Leng, from ancient vampire-like horrors to clockwork-driven automatons, the Run Amok Bestiary contains dozens of challenges for your PCs. In addition to monsters ranging from CR 1/2 to CR 19, four new templates allow you to customize creatures in all new ways. More than mere monsters, the "Run Amok Bestiary" includes new PC-appropriate races, familiars, animal companions, and numerous adventure seeds to bring these creatures to life! Get it here from Paizo or here from RPGNow. An enterprising gnome merchant seeks to reopen the long-abandoned underground road between his town and a dwarven settlement several days distant. The road has been untraveled for centuries, so he needs a group of brave explorers to venture forth along the abandoned route. More than monsters and underground hazards await: the intrepid adventurers uncover a wide-reaching plot that puts their skills and knowledge of the Broken Road to the test! 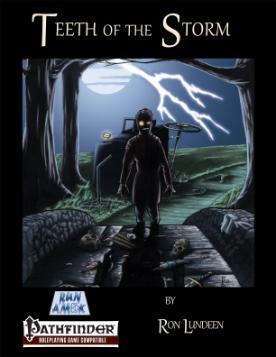 "Perils of the Broken Road" also contains an eight-page gazetteer of Fibblebrod, the launching point for this adventure and a frontier boom town suitable for use in any game world. "Perils of the Broken Road" is an underground and urban adventure for the Pathfinder Roleplaying Game suitable for any game world. Presented for PCs of 3rd or 4th level, this adventure also includes notes and statistics for scaling challenges for PCs of higher or lower level. 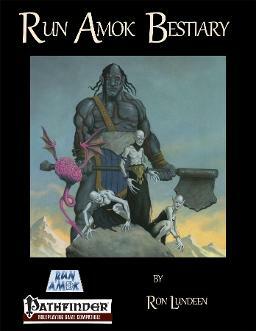 "Perils of the Broken Road" also includes full alternate statistics compatible with the beginner rules variant of the Pathfinder Roleplaying Game. The adventure contains player handouts, pregenerated characters, and a file containing full-color 1 inch square maps of the encounter areas ready for printing. 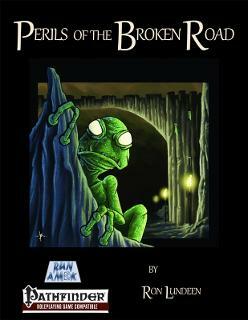 "Perils of the Broken Road" is written by Ron Lundeen, with art and maps by Blake Wilkie, Marco Morte, Tommi Salama, Sydney Lehmann-Secor, and more! Get it here from Paizo, here from RPGNow, or here from the d20PFSRD store. 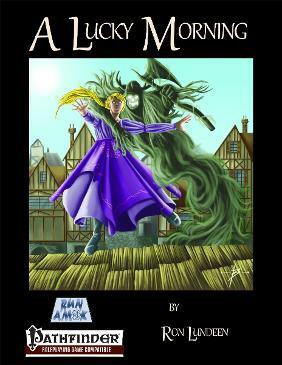 Run Amok Games' highest-level adventure, reinvented with mythic proportions! This new edition of 2013's "Kingdom of Toads" contains updated threats to challenge mythic PCs, new treasures, updated art, and pregenerated PCs bearing mythic power! The curse will echo in legends: in one dire moment, each man, woman, and child in the Kingdom of Kelwyk was transformed into a simple toad. Only the king's advisor retains enough of his mind to summon aid. Has Kelwyk's decades-old foe, the vile witch Vakelna, wrought her vengeance at last? The world's greatest champions are urgently needed to unravel the mystery of the Kingdom of Toads. "Kingdom of Toads: Mythic Edition" is an adventure for the Pathfinder Roleplaying Game of legendary scope and suitable for any campaign world. Presented for PCs of 17th or 18th level with 7 or 8 mythic tiers, and specifically designed to accommodate the varied and spectacular powers of high-level mythic PCs, this adventure also includes notes and statistics for scaling challenges to PCs of lower or higher level. 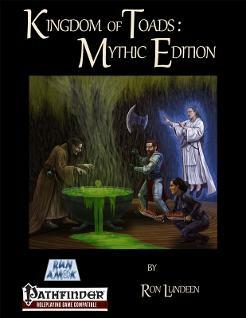 "Kingdom of Toads: Mythic Edition" is written by Ron Lundeen and illustrated by Jeff Strand and Blake Wilkie. 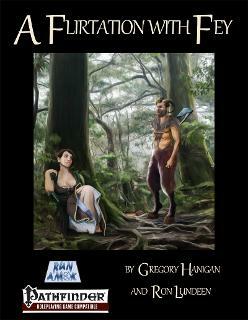 "A Flirtation with Fey" is an urban adventure for the Pathfinder Roleplaying Game. 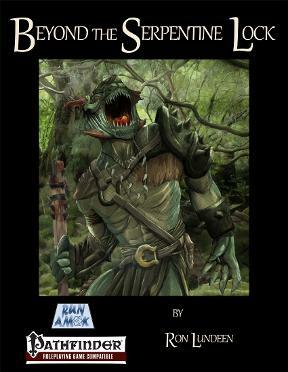 Presented for PCs of 3rd or 4th level, this adventure also contains notes and statistics for scaling challenges to PCs of higher or lower level. The adventure features numerous player handouts and clues, pregenerated characters, an urban gazetteer, and a file containing 1-inch square maps of all encounter areas ready for printing. "A Flirtation with Fey" is written by Gregory Hanigan and Ron Lundeen, with art and maps by Marco Morte, Blake Wilkie, Richard Chaplin, Jeff Strand, and Tamas Baranya. 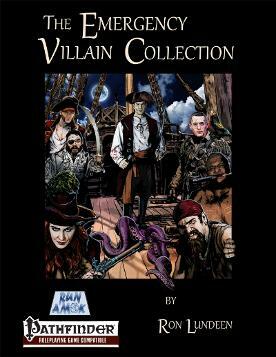 “The Emergency Villain Collection” is written by Ron Lundeen, with art by James Groeling, Rick Hershey, and Sydney Lehmann-Secor. Or pick up a FREE preview here from RPGNow or here from the D20PFSRD store! "Kingdom of Toads" is an adventure for the Pathfinder Roleplaying Game of legendary scope and suitable for any campaign world. Presented for PCs of 17th or 18th level, and specifically designed to accommodate the varied and spectacular powers of high-level PCs, this adventure also includes notes and statistics for scaling challenges to PCs of lower or higher level. 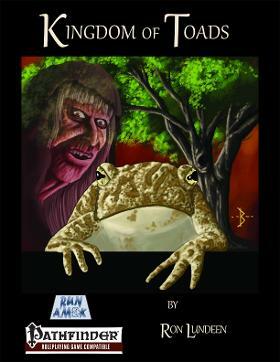 "Kingdom of Toads" is written by Ron Lundeen and illustrated by Blake Wilkie. Or pick up a FREE preview here from RPGNow, or here from the D20PFSRD store. "Must Buy - This is one of the best NPC Collections to come along in a bit. It outshines anything that the big boys have produced." - Nathan C.
"Teeth of the Storm is an excellent adventure across the board...I personally found it to be a well told and gripping experience, and it was a fine substitute for the Ravenloft campaign setting. I’m definitely going to keep Run Amok Games on my radar thanks to Teeth of the Storm." -Alexander L.
The remote village of Yonderdell has harbored dozens of adventuring parties over the years, each passing through on their way the nearby entrance to the Underdelve--the endless complex of lightless subterranean passages. Now Yonderdell is plagued by a ruthless nocturnal stalker. Several of the townspeople have disappeared; one was found horribly murdered. Locals suspect a creature from the Underdelve, but the guards posted at the entrance have seen no sign of creatures from the night below emerging onto the surface. This simple village needs brave heroes to unravel the clues and stop the terror before more lives are lost. “The Six Griffons Haunt” is an investigative adventure for the Pathfinder Roleplaying Game that can be set in any large city. 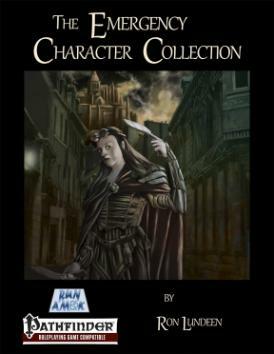 Presented for PCs of 3rd or 4th level, this 32-page adventure also includes notes and statistics for scaling challenges to PCs of higher or lower level. The adventure contains a new monster, several player handouts, and a file containing a 1 inch scale color map of the lodge ready for printing. 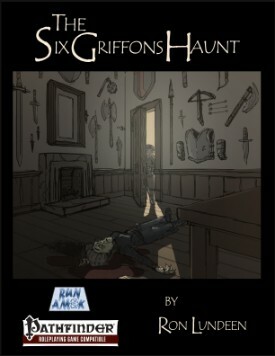 “The Six Griffons Haunt” is written by Ron Lundeen and illustrated by Jeremy Thompson, with maps by Hugo Solis. Get it here from Paizo, here from RPGNow, here from DriveThruRPG, or here from the D20PFSRD store!